My pal, Gilah Rosner and I love to share recipes, kitchen wisdom, and nutritional science tidbits. We know that deciding what to eat has gotten so complicated, it seems you need a scientist in the kitchen. But don’t worry – now you’ve got two! We’ll serve you bite size portions of the latest nutritional science, along with generous helpings of traditional wisdom regarding the preparation and enjoyment of wholesome food. Mostly we are two foodies who want to have fun in the kitchen, then sit down to the sensuous pleasures of leisurely enjoying a beautiful meal. Here are our criteria for what to cook. The food must be delicious, nutritious, relatively quick to prepare and look gorgeous. It’s easier than you think. Today we’re serving up spaghetti squash with Parley Lemon Pesto. This delightful condiment can act as a sauce, dip, spread or dollop that delivers a wallop of flavor and nutrition when added to a soup, cooked vegetable, sandwich or healthy grain. Don’t scoff at humble parsley – it’s packed with intense peppery flavor and phytonutrients with many health benefits. Parsley was one of the featured “Superfoods of the Week” in my 10-week webinar course, The PlantPlus Nutrition Program, based on my book, The PlantPlus Diet Solution: Personalized Nutrition for Life. For week 9, I asked Gilah to pinch hit for me as lecturer. One of her tasks was to pick a superfood and share a recipe. 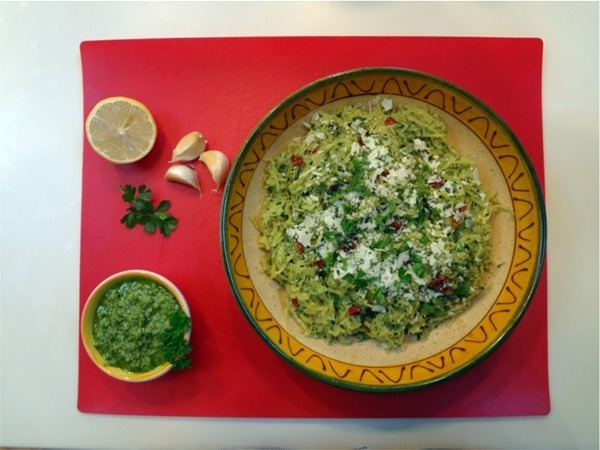 We were absolutely amazed by this easy pesto’s taste, nutrition, beauty and versatility. Parsley is rich in fiber, chlorophyll and micronutrients like vitamin C and vitamin A, and it’s simply loaded with vitamin K, which improves calcium absorption. Thus Vitamin K is important for healthy bones and a healthy heart. Parsley packs a punch with its vitamin K content, more than any other green herb or vegetable. Parsley, like many vegetables and fruits rich in anti-oxidants and phytonutrients, can help fight inflammation – the underlying cause of most chronic and degenerative diseases like hypertension, diabetes, cardiovascular disease, obesity and autoimmunity. Parsley contains a plant pigment called myricetin, thought to have preventative effects in skin cancer and in diabetes. Traditional herbalism teaches that parsley is also a wonderful digestive – one of the classes of aromatic herbs with square stems and leafy greens that help stimulate digestion and eliminate sluggishness. Particularly after a meal, munching a few springs of parsley is wonderful for good digestion and fresh breath. Add a generous handful of parsley into eggs, pasta, salads or salad dressings, or even into your morning smoothie! It’s really delicious. Or enjoy this fast, easy and delicious pesto. Put everything in a food processor or blender and mix to a uniform consistency. Now, taste it! Do you love it as is, or can you perfect it a bit? This is where the art of cooking comes in, and you are the artist. Would you like to add some grated Parmesan or Romano cheese? Go for it… you’ll probably need more oil to keep the proper consistency. Does it need more garlic or more lemon? Remember, a recipe is only a suggestion. Use what you have on hand, and play with your food so that it tastes absolutely scrumptious to you. 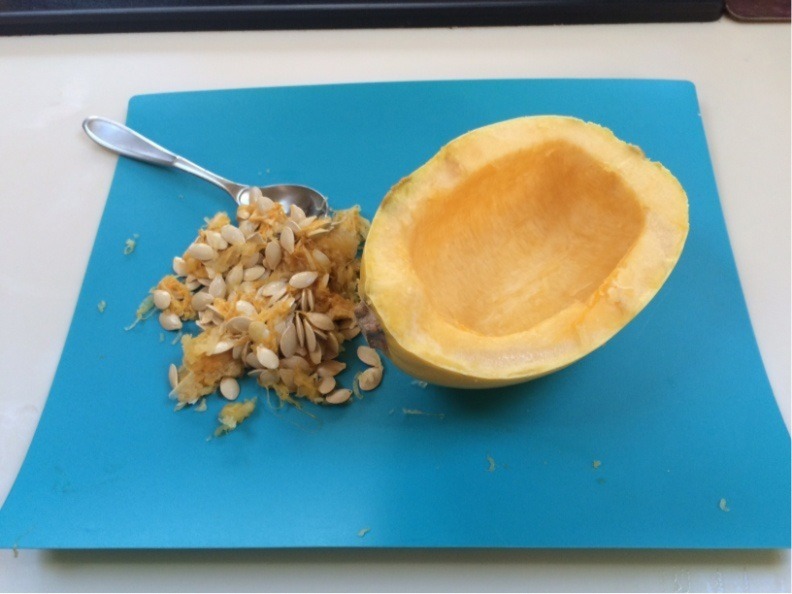 Cut the squash in half, and scoop out all the wet, stringy interior and seeds with a soup spoon. You can toast the seeds later if you like. Smear a little olive oil on the cut sides, turn upside down on a baking pan, and cook at 375 degrees till tender when pierced with a knife, about an hour. When cool, scrape the strands of squash out of the shell using a fork. Mix squash with some Parsley Lemon Pesto to coat the strands, and optional sun dried tomato. 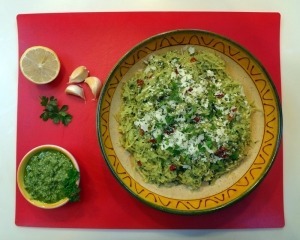 Top with parmesan cheese and chopped parsley. Isn’t that gorgeous? Now pour yourself a glass of wine or other festive beverage of choice, light a candle, and enjoy your meal on a beautiful plate, with a lovely placemat or table cloth, and some soothing background music. Your body, heart, mind and spirit will thank you. Ah…life is good. Dr. Joan and Dr Gilah are cooking up an intimate 4-day hands-on workshop in Santa Fe exploring mind-body-spirit approaches to optimal health, pleasure and well-being. Join us for Self-Caring in Santa Fe, September 21-25, 2018. Deciding what to eat has gotten so complicated, it seems you need a scientist in the kitchen. So don’t worry – now you’ve got two! Mostly we are two foodies who want to have fun in the kitchen, then sit down to the sensuous pleasures of leisurely enjoying a beautiful meal. Join me along with my pal, Dr. Gilah Rosner, in my home town of Santa Fe, September 7-11, 2016 for our retreat, “Ancient Wisdom, Modern Science, Joyful Eating”. We’ll serve you bite size portions of the latest nutritional science, along with generous helpings of traditional wisdom regarding the preparation and enjoyment of wholesome food. Doesn’t that sound like a lot of fun? Join my mailing list today and receive our free article “Two Scientists in the Kitchen” with recipes, photos, and lots of great nutritional information. Wellness is really on my mind and it might be on yours, too. It’s the end of January, the time when resolutions to get healthy often fall by the wayside. But this year I’m determined to stay my healthy best. And yes- there’s a story behind that motivation. Last fall I developed sciatica. I’d heard of it, of course, but it’s another thing entirely to experience it. Busy and traveling, I had to restructure my life and pay a lot of attention to my body, or risk losing mobility. Pain is a powerful motivator.